Officials from the Augusta and Gardiner police departments said little information is available until the bones are identified. AUGUSTA — No new information was available Tuesday about a city police investigation into human remains found Sunday afternoon in the woods off Washington Street. 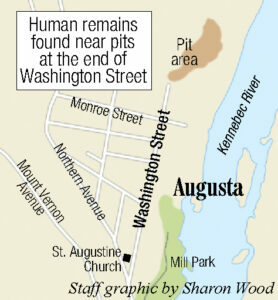 Augusta police Deputy Chief Kevin Lully said bones were discovered by a person walking “beyond the pits” on the north end of Washington Street — which is just north of Mill Park — around 1:30 p.m. Sunday. Police reports labeled an incident at 1:32 p.m. as “suspicious activity,” with officers staying at the scene until about 8 p.m.
Lully said Monday city police have contacted Gardiner police and the state police Major Crimes Unit in connection with the case. Gardiner police Chief Jim Toman said Tuesday his department spoke with Augusta officers on Sunday and Monday but did not speak further on Tuesday. He said little will be known until the remains are identified. Lully said Monday said an identification of the remains could take some time. Lully said no specific location was available because it was “part of the investigation.” He said Sunday there was no danger to the public related to the remains.